It’s the longest nerve in your body and also known as the wandering nerve so you better be aware of it. 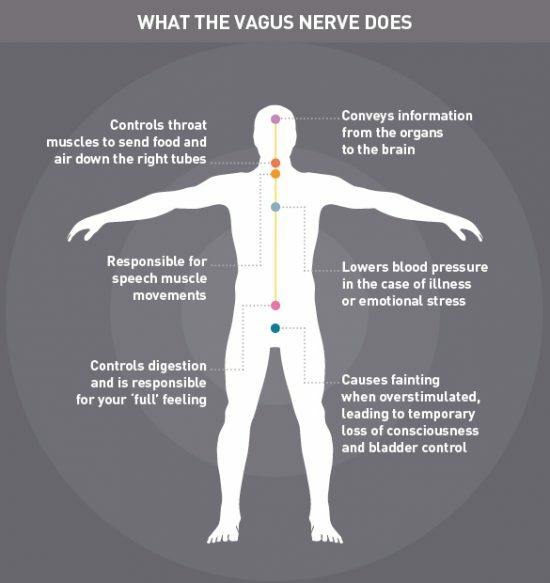 Find out about the Vagus Nerve and how to get it working for you. The Vagus Nerve is the longest nerve in your body. It originates in the brain and then travels through your digestive system. It is the body and mind connection and is being increasingly seen as the super highway of our nervous system. We have 2 sides to our nervous system. The first is the parasympathetic nervous system. This is the ‘rest and digest’ part. On the flip side, we have our sympathetic nervous system which is ‘fight and flight’. This is the part that kicks in when we are being metaphorically chased by a tiger. It’s also the side that most people live in on a daily basis. It’s your bodies survival, or emergency mode, that is responsible for all your stress and anxiety. As you can see from the infographic above from Horizon Magazine it controls your digestion and gives you that full feeling which is essential in maintaining a healthy weight range. Amy from ‘My Life Delicious’ gives an overview of the Vagus Nerve and also how you can stimulate it. Gargling, humming, yoga, meditation and breathing are some of the ways. If you are feeling anxious and overwhelmed, your Vagus Nerve is no doubt behind it. When your Vagus Nerve loses tone it needs resetting. You can enjoy many benefits including better bowel movements and balancing your gut. It supports your immune system, healthy blood pressure, decision making and so much more. This infographic from Hearty Soul shows you some simple tips and tricks including simply splashing cold water on your face. If you suffer stress and inflammation and even migraines, the vagus nerve should be one that you start researching. Here’s a handy tip from Empoweringnrg.com. They have this great tip known as the Oxytocin Breath that raises your vibration, shifts you out of fight and flight and produces the all-important love hormone, Oxytocin. Be sure to give it a try.